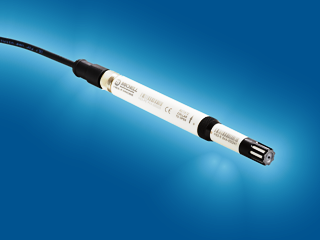 The new HygroSmart HS3 probe from Michell Instruments has been designed to withstand the kind of harsh and demanding conditions found in industrial processes. Unlike many ‘disposable’ probes that have a short life within harsh conditions before needing to be replaced, the HygroSmart HS3 sensor uses Michell’s polymer tile to give long-term reliable measurements. In addition, it also has an accuracy of 0.8%RH, making it among the most accurate and reliable RH probes on the market, as well as allowing for longer recalibration periods. This not only gives peace of mind to process operators, but also provides a low life-time cost of ownership when compared to the disposable probes. The HygroSmart HS3 consists of a solid, corrosion-resistant probe body with an interchangeable sensor. When recalibration is due, the old HygroSmart HS3 sensor is simply exchanged for a new, freshly calibrated one. This simple procedure takes only a few seconds to carry out with the probe itself remaining installed. Replacing just the sensor, rather than the whole probe, is not only quick and simple, it also saves users money over the lifetime of the probe. In most industrial applications, RH probes have to withstand vibration, exposure to water, occasional heavy shocks and high levels of electrical interference. The HygroSmart HS3 body is designed to cope with all these environmental factors. As well as the solid body, the probe also has a 10 bar pressure rating, rfi/emc electrical noise approvals and IP67 ingress protection rating. As well as its ability to withstand harsh process conditions, the HygroSmart HS3 probe also gives control to the user, as it is 100% configurable. This gives users the ability to alter their RH and temperature measurements to keep step with changes or developments in their process, with no extra costs.